A desire for beautiful views across open countryside and a longing to live in a period property were what sealed the deal for Kate and Paul Gerrish when they found their ideal rural retreat: this converted barn in the middle of a tranquil farming hamlet, within the scenic Oxfordshire countryside. ‘The children had left home so we took the opportunity to downsize, selling our three-storey, six-bedroom modern house in a nearby town,’ says Kate. ‘The children had left home so we took the opportunity to downsize, selling our three-storey, six-bedroom modern house in a nearby town,’ says Kate. The Grade II-listed building dates from the 1850s, and was converted in the late 1990s into a characterful home. ‘We knew the area and had always liked the peaceful location,’ says Kate. The house was empty when the couple viewed the property, which gave them ample time to decide that they could make it their home. The kitchen and bathrooms were fitted with good quality cabinets and sanitaryware, but the style was rather dated. 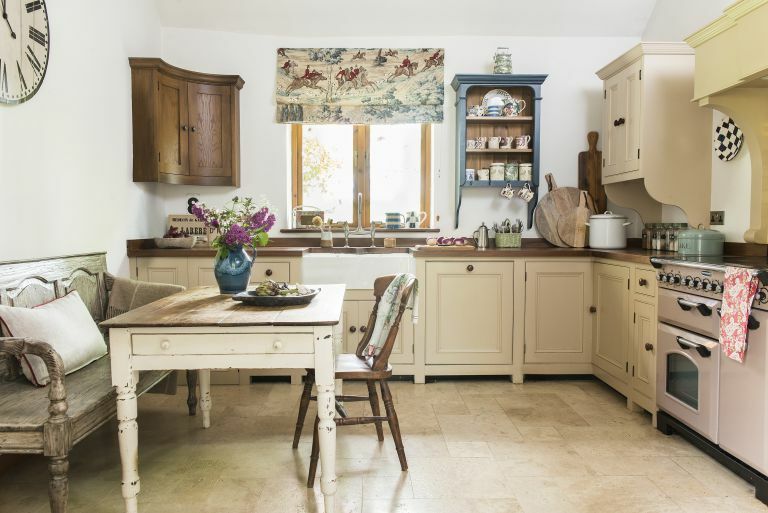 ‘Our plans for the kitchen included simple, traditionally built cupboards, leaving space for a dining table and seating,’ she says. With plenty of ideas and colour combinations in mind, Kate and Paul set about their first project, and enlisted local company Hunt Bespoke Kitchens and Interiors. At the heart of the home is the living room, with its vaulted ceiling and a stylish combination of plush velvet sofas and French antiques. ‘I opened a small unit in a local antiques centre eight years ago, and built up a good customer base,’ explains Kate. The barn now has a pleasing spacious quality, enhanced by Kate’s blend of furniture, art and accessories. As well as the main barn there’s a small garden building. ‘One of the main attractions for us was the mini cottage at the bottom of the garden,’ says Kate. Kate and Paul are now working on the garden itself. ‘We decided to improve the layout by removing some of the older shrubs and hedging, and introduce a new planting scheme in pastel shades,’ explains Kate.